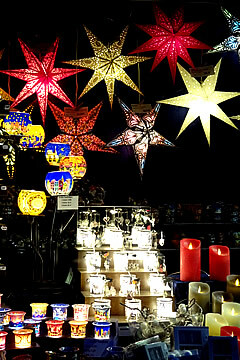 Visiting Berlin principally for the Christmas Markets we took time to explore surrounding towns and discovered a fascinating Stasi Museum, a citadel with an immense history and a king's favourite summer palace - as well as more Christmas Markets! 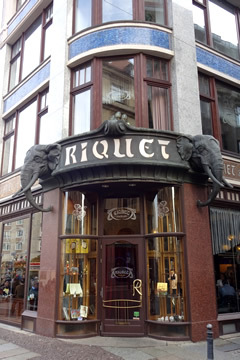 Art Nouveau coffee shop Riquet. 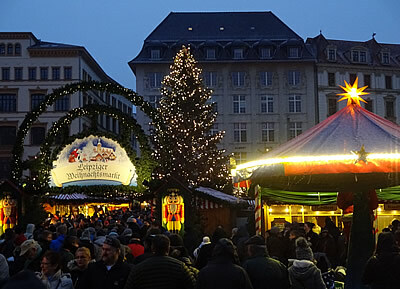 Leipzig has quite a large Christmas Market, centred on the Marktplatz, and dating back over 500 years. 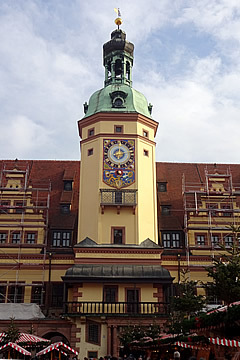 CLock tower on the Town Hall. 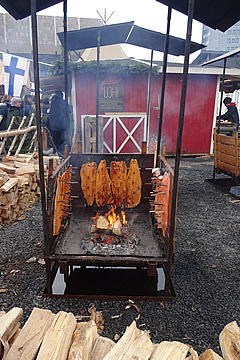 We saw a lot of salmon being smoked at Christmas Markets in 2018. The beautiful interior of St Nicholas Church where we listened to an oratorium for a while. 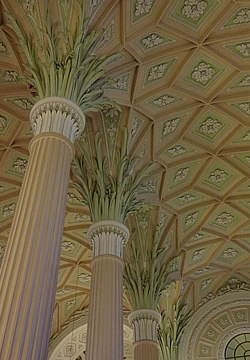 The palm capitals on the columns are particularly striking. Office of an employee of the Ministry of State Security. 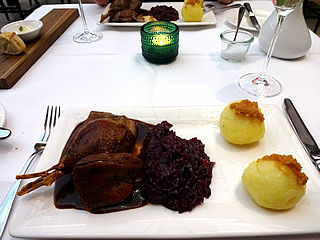 We had an excellent late lunch at Max Enk: superb goose and surprisingly good red cabbage - not something we're usually fond of - but we did not like the sticky, stodgy balls of something served with it which may have been polenta! Entrance to the Stasi Museum. The Ministry for State Security operated a policy founded on fear, penetrating people's private lives, encouraging everyone, no matter how young, to inform on others. Not surprisingly this created deep mistrust among the population. The Stasi had many ways of spying on citizens: surveillance cameras watched, bugs listened, letters and parcels were intercepted, as well as encouraging neighbour to inform on neighbour and even children to inform on their parents. The declaration of one student to act as an informer is on display, dated 31.10.1989 - just a few days before the wall came down. 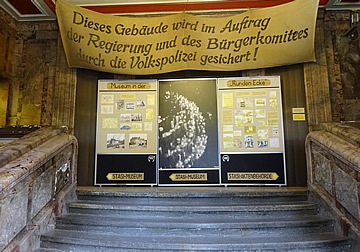 The peaceful revolution had begun Leipzig in the autumn of 1989. Monday services and meetings in the church of St Nicholas had been attracting more and more people. On Monday October 9th 8,000 people crammed into the church and after the service tens of thousands of people took to the streets in a peaceful demonstration, all the while fearful of violent reprisals. 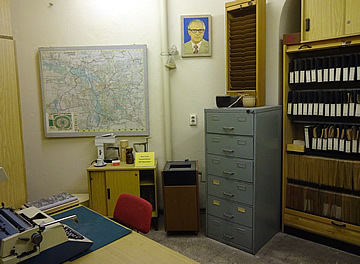 The Stasi offices were occupied on the night of the 4th December by citizens determined to preserve the many thousands of documents stored there, including files on the citizens themselves - they can now apply to see their own. 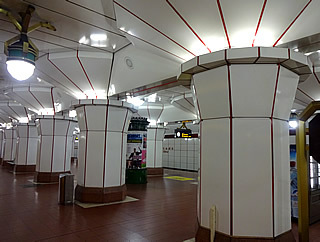 The drab offices and long corridor are kept in the same state as when they were in use. A grim office environment devoted to keeping the German people in check. 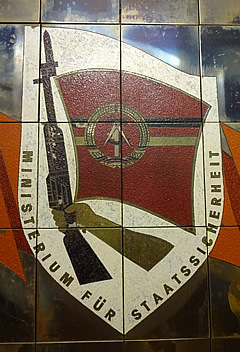 The Stasi worked closely with the KGB which had an officer in every Stasi office. 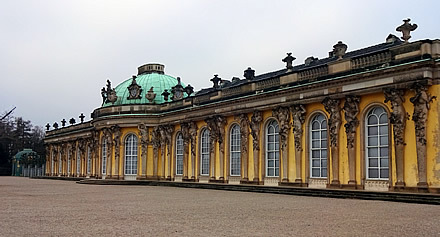 We came to Potsdam, about 25 km from Berlin, to visit Sanssouci2 (without care) - the favourite summer palace of Frederick the Great. 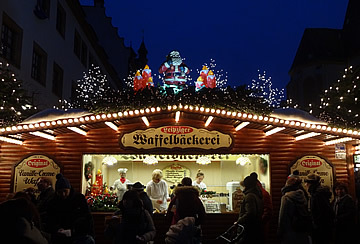 But there was, of course, a Christmas market in the town, extending down the length of one long street. 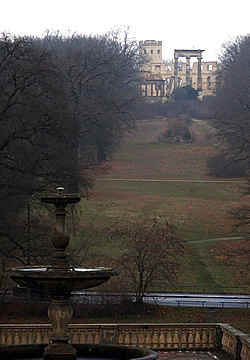 The palace was closed for the winter and the formal gardens were of course quite bare, the statues wrapped up against the cold, but it's a pleasant place to walk even so. 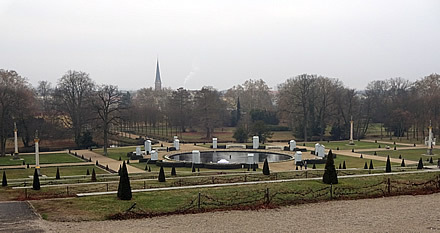 Terraces and formal gardens in front of Sanssouci - rather bare in winter! 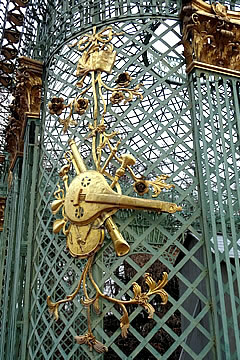 Sanssouci Park is vast, 290 ha, and is home not only to Sanssouci Palace, built between 1745 and 1747, but also the New Palace, a much larger baroque affair completed in 1769. 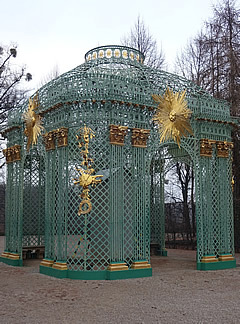 The rococo decoration of Sanssouci is rather too florid for my liking but its situation is impressive, at the head of a series of vine terraces which drop down to formal gardens. 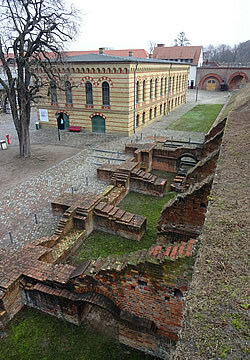 Artificial ruins on "Ruinenberg" opposite the palace. 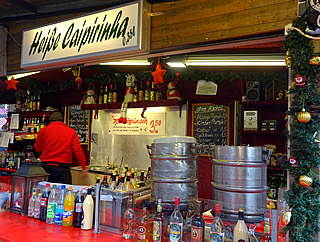 Hot caipirinhas for sale at the Christmas Market. 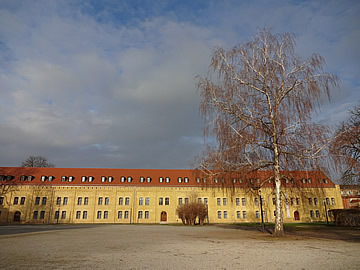 Famous for its prison, which was demolished after Rudolf Hess died there, and its Renaissance citadel. 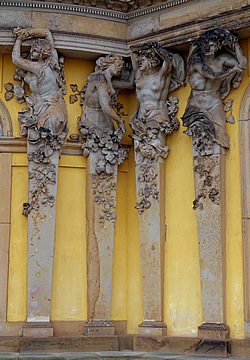 The term Spandau Ballet was coined with two possible meanings: either the jerky movements of WW1 soldiers shot with the Spandau machine gun, or the similar convulsions of a prisoner being hanged. 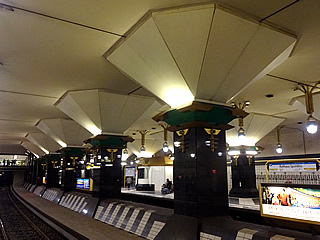 Spandau also has two rather fine u-bahn stations: Rathaus and Altstadt. 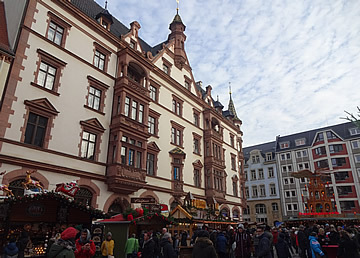 We came to wander the Christmas Market and visit the citadel. The market was unremarkable apart from a hot caipirinha - never before encountered and pronounced very good. The citadel,3 however, was fascinating, and we spent some time exploring. The entrance and guardhouse dating from the 17th century. 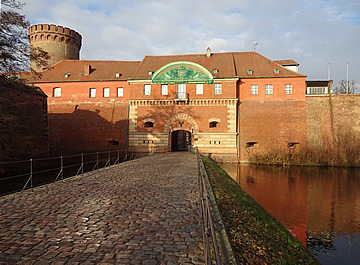 The fortress is built in at the point where the rivers Spree and Havel meet. 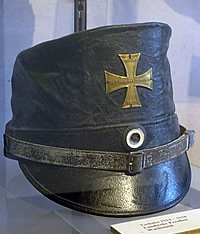 A castle is first mentioned in documents at the end of the the twelfth century but the fortress was begun at the end of the 16th century to protect Berlin. Over the centuries it has been altered and added to, but its essential structure remains unchanged: basically a quadrilateral structure surrounded by water with four massive bastions at he corners. 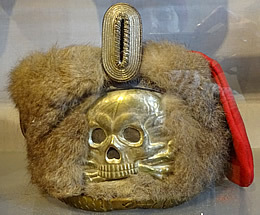 Destroyed in 1813 when Prussian and Russian troops fired on the fortress which was occupied by the French. The light building behind is the new arsenal. 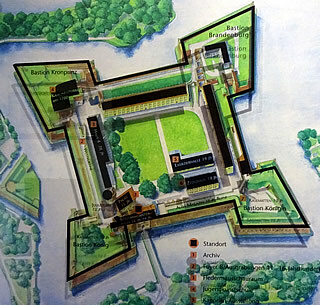 There is an exhibition on the history of the fortress illustrated with models, paintings and militaria. 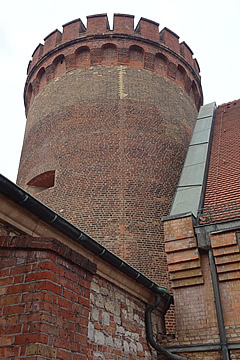 The Julius Tower is the oldest building in Berlin, built at the beginning of the 13th century and incorporated into the fortress. 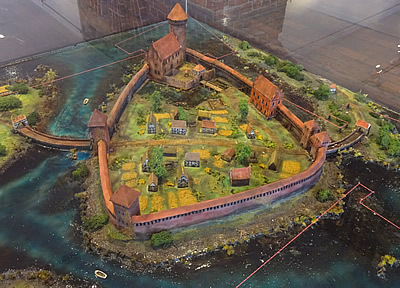 Model of Spandau castle in the latter half of the fifteenth century. 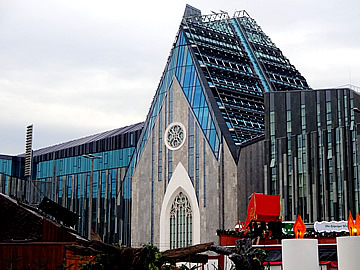 Note the Julius Tower. 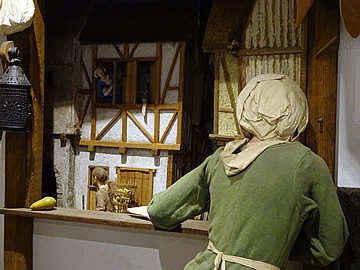 Diorama of life in a medieval town in the City History Museum in the Arsenal. Interesting though the fortress is, the excavations beneath the West Curtain rampart are fascinating. 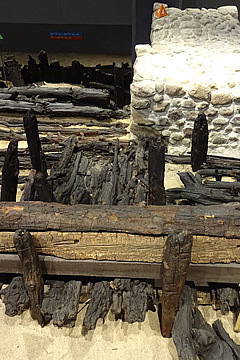 In the eleventh century there was a Slavic settlement here, wooden buildings surrounded by a wood and earth wall. The excavations cover quite a large area and have revealed remnants of this ancient wall, of the later stone castle wall which predated the fortress, and the Renaissance palace complex.